I have been utilizing Hersey Bins for the past 5 years at the Mission Thrift Store in Fergus, and I always refer to them as my favorite service provider-because they truly are just that! The customer service provided is impeccable. I will send an email requesting a pickup, and it will be done that day or the day following-response to my emails is always prompt. I never understood how anybody can get excited about a service provider-but truly, these people are fantastic! Do not go to Waste Management or any other provider-these guys! The people at Hersey Bins were very helpful and prompt when answering emails and phone calls. They were nice to talk to as well, someone that wanted your business not just taking calls. They followed up after delivery of the bin and then again before pickup to make sure we had enough time. I thought the follow-up calls were a nice touch. The driver when the bin was dropped off was also friendly, and polite. I wouldn't hesitate to use them again. Needed a 20yd dumpster on no notice. They had it here when I needed it. Driver put wood under the skids so as not to damage the driveway without being asked. They followed up to make sure everything was good, and to verify pickup. That too was exactly when I requested. What more can you possibly ask! Excellent. Not really knowing what I needed, I made a call to Hersey and was guided through the process. With very patient customer service answering my questions. From call to pick up I was given the feeling I was their top priority. Would definitely recommend your service to anyone and will definitely use you in the future. We had a bin dropped off last weekend, filled it up and picked up the next day when we called for an early pick-up. My final bill was e-mailed to me the next day after pick-up like they advised me it would be. Everyone was very helpful, and the price was great for the amount of renovation garbage we had to get rid of. I will defiantly be using them again. I will now use them exclusively! I do a ton of commercial renos and usually use whoever the customer is already using for their waste (keeping things simple). I have seen it all! Other companies don't think they are dealing with a professional, rather than just a regular customer who they can get a quick gouge in. I generally know my costs and am willing to let a little extra slide in the interest of convenience, but recently I have seen gross overcharging and misinformation when I get the invoice, especially if I run rentals through my clients existing account. Hersey has never been a surprise, and always have been upfront about fees etc., and always very accommodating when a rush job arises. Also, the drivers are pretty cool and helpful if drop locations are challenging. I thought I was the only company that actually cares!! They are growing and acquiring for a reason - Good job. Customer service was great with answering questions and delivery of the bin was fast (next day). I like that the bin was on wood, so it wouldn't damage our driveway. Good experience overall and would use again. I was amazed at how quickly and professional they are! We would recommend them to everyone. Thank you for looking after us. Ordered a bin from Hersey, and once again the service was great. Drivers and office staff really care about their customers. Plus, they are always very friendly and always deliver, and take away the bins as scheduled. I am more than impressed with Hersey's. After using multiple bin services that were unreliable and even at times held us hostage at the mercy of when THEY want to pick up the bin's, Hersey's has been the exact opposite. The staff to schedule and pick up the bins were impeccable and professional. They even called to ensure the use of the bin was satisfactory and pickup was on-time. Although I am still waiting on the final invoice I am more than happy with Hersey's thus far and will continue to use them for all my bin rental needs. Thank-you Hersey Team. Being a concrete contractor, it can be difficult to find companies to take broken up concrete. They are very well organized and reliable. Thank you! From the phone call inquiring about the bin, to the drop off, to the pickup and can't say enough positive about this company. The phone calls making sure the bin was dropped and placed properly the calls asking if I needed more time the follow up to make sure the bin was picked up and no damage to my property, the promptness and professionalism is second to none. 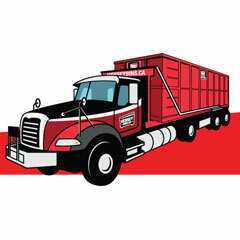 (both drivers and office staff) I HIGHLY recommend this company. If I could give more than 5 stars I would!!!!!!! I'm a contractor and just moved into the area. Having dealt with many such companies in the past I am fortunate to have found Hersey Bins. They always do what they say, they run their office professionally, and make me feel like a customer not a number. Thank you for professional, reliable service with no hidden costs. I have been using Hersey Bins for a while now and not only do i love the service, my customers talk about how good the drivers are when placing the bins and looking after their driveways!! Way to go Hersey!!!!!! I'm a contractor in the Kitchener, Waterloo and Cambridge area. I use Hersey Bins exclusively because of the fantastic customer service and very prompt delivery. I would recommend Hersey Bins. Thanks to a violent May storm I found a SUDDEN need for new shingles on a Friday and when I called mid-morning the bin was promised by 1:30 pm .....WOW ..... dropped bin exactly where was best and so the project was underway ..... I called and was promised pickup next am and sure enough on time AGAIN so therefore .....WOW WOW ....thanks to everyone there. I have been using Hershey bins on my job site for a few months and they have been fantastic. Great customer service and they take care of things quick! Great job putting the bin down on our brand new paved driveway, pickup and delivery as requested, will use them again. Reliable delivery and good customer service. My 10-yard bin was set up on wood planks to keep it off the ground. Picked up as scheduled and covered with mesh screen to keep my driveway clean. After the bin was taken to the dump, I received an email within a few hours detailing my charges. I would use Hersey Bins again. Hersey Bins is a great company and one that I'd recommend to all my family and friends. Their customer service is friendly and very helpful. Their prices are very affordable too!